Soft diffused light streaming through colorful church stained glass windows lends a more reverent atmosphere to any church, synagogue, or chapel. They can instantly change the mood of a church sanctuary from that of an auditorium to a quiet restful place of worship. 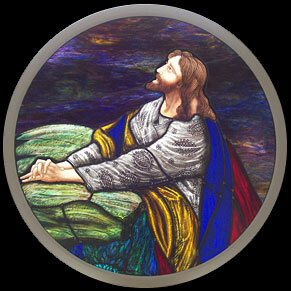 Church stained glass windows can be produced with opalescent and/or cathedral glass. Opalescent glass contains 2 to 5 colors and is more opaque and dense. Density of opalescent glass refers to light transmission. Opalescent glass can be used to control light and create drama. Cathedral glass is usually one to two colors and allows light to come through. No church is complete without stained glass windows. See our photo gallery of New Church Stained Glass Windows and contact us today for more information or a quote.